The Irish Lotto has one of the easiest to win jackpots in the world. Of course 'easy' in lottery terms. It's a 6 balls from 45 game making the jackpot 1-in-8 million rather than the 1-in-13 million of a typical 6 from 49 lottery game such as the UK Lotto. But the jackpot is still a decent €2 Million. So WinTrillions have decided to add an Irish Lotto syndicate to their growing list of syndicate options. 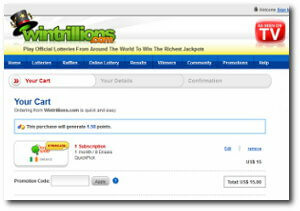 WinTrillions have been offering an online lottery ticket buying service since 2006. And like all the online ticket services, you're usually better off buying elsewhere. But the syndicates thankfully do offer better value for money, as you're getting all the syndicate management and prize distribution tasks done for you. For the Irish Lotto syndicates WinTrillions have decided to go with syndicate groups of 55 players, which is a few too many really. And each group buys a total of 20 tickets, for an individual player cost of US$2 per draw. All prices are listed in US dollars on the site - but your credit/debit card provider will automatically convert this to your local currency, be that Euros, UK pounds or anything else. You can play for as little as 2 weeks at a time, which covers 4 draws as the Irish Lotto is played twice a week (Wednesday and Saturday). Giving a minimum playing cost of just US$8. But if you choose to play for longer, the price per game is cheaper. So take this option if you know you will keep playing, it could save you up to 12.5%. Winnings are shared equally between all paying members of the group. The company doesn't take any share in the syndicate groups. There is no charge on winnings, or for withdrawing your winnings by check. You can join online using the usual credit and debit card options. Once your application has been processed (allow a day or so for this) WinTrillions then send you scans of the tickets that your group will be playing. You then receive an email every time your group wins a prize, and can also subscribe to get results by email too. It is managed well, by a company with a lot of experience. But we would like to see a few more tickets for your money, which would bump up their rating significantly. Choose the longer playing frequencies to improve the value. If you want to play the Irish Lotto in a syndicate and can't find one offline, this is a reasonable option. It's also pretty much your only option. Back To Irish Lotto Syndicate listings.